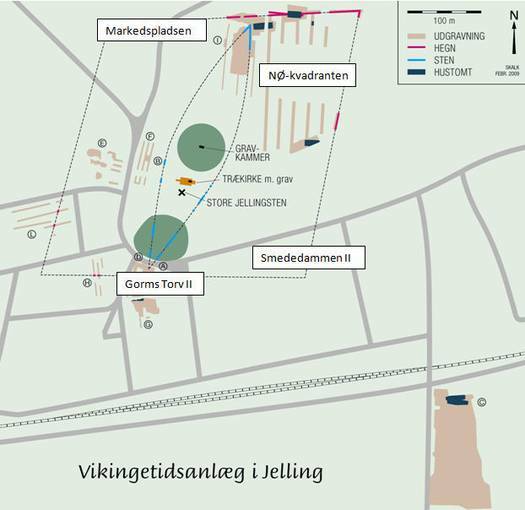 Summary of Viking Age finds and excavations in Jelling 2010. From the periodical SKALK 2009,1. In 2010 the Jelling Project continues its archaeological and natural science investigations in and around the monument complex at Jelling. The excavations are primarily targeted upon the large palisade structure, which encloses the mounds and the church. Small excavations in the south and north-west are expected to produce further information about the palisade’s southern course and to locate its south-east and north-west corners. A larger area in the palisade’s north-eastern quadrant will hopefully reveal traces of the activity we suppose took place within the palisade and in its immediate vicinity. The excavations are carried out in a collaboration between the Jelling Project, Vejle Museum and Aarhus University. These will be supplemented with the results of Vejle Museum’s investigations in advance of the reorganisation of the local traffic system, which forms part of Vejle Council’s local development plan for Jelling. The boreholes drilled into the South and North Mounds in 2009 by the Department of Geography and Geology at the University of Copenhagen and the National Museum’s Department of Danish Prehistory/Natural Science will be expanded upon in the autumn when bore hole samples are taken from the Many Mounds in the north. The aim is to compare the composition of the mounds and the character of their soil and thus learn more about the landscape in the Viking period and the centuries before. It is also hoped that a closer date for the mounds can be obtained and perhaps also to find out whether the core of the North Mound really is a much older Bronze Age mound, as was presumed after the 1942 excavations.